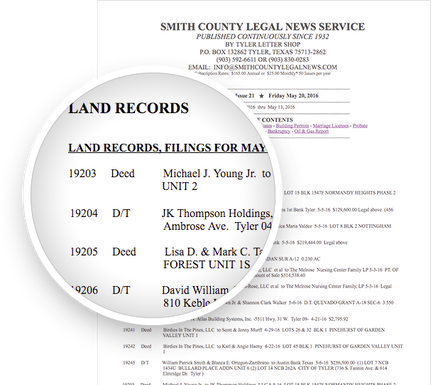 Get a weekly list of new divorce filings in Smith County Texas. For employers, landlords, bankers, credit reporting services, attorneys, or anyone interested in up-to-date Petition for Divorce filings in or around Tyler, TX. How will the divorce of a customer, client, or friend affect you or your business relationship? Those involved in the divorce will have some changes to make such as living arrangements and financial responsibility for joint or individual debt, and contractual obligations, and may affect business, friends, clergy, employers, creditors, and family. Be in the know.